that should be used by adults. 1/2 pound of #61 Rapid Polish. UV Mini Bowl machine dimensions - 8.5" diameter x 10" high. This small capacity vibratory tumbler is a new addition to the Thumler's Ultra-Vibe vibratory tumbler product line. The UV Mini Bowl will process approximately 4 pounds of material, including both rocks and media, at a time. This smaller capacity is great for people who prefer to run small batches or for experimenting to get the best results on a certain type of material. If you currently run a small capacity rotary tumbler this machine will make a great addition to your tumbling equipment. You can run one or two batches through coarse grit in your rotary tumbler and then finish them more quickly and using less supplies with this UV Mini Bowl vibratory tumbler. We think it is the perfect companion for a Thumler's A-R2 rotary tumbler. After running the two 3-pound barrels of material through coarse grit you should have about 3 pounds of material ready for medium grit. Place that rounded material into the UV Mini Bowl bowl and add ceramic media to get the UV Mini Bowl bowl up to operating capacity. Plastic pellets are not recommended for use in vibratory tumblers. 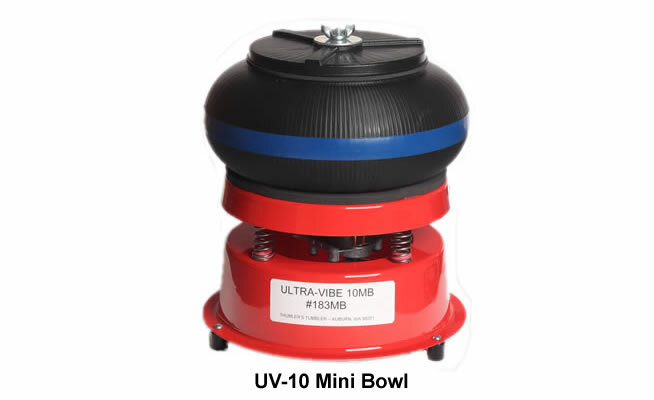 The bowl on this UV Mini Bowl vibratory tumbler can handle rough up to about 1 3/4 inches in diameter. If the piece of rough is more of an egg shape the long axis can be longer than 1 3/4 inches but the narrow part of the stone must be 1 3/4 inches or less. For best results we suggest not putting more than 2 or 3 pieces of that size in the bowl at a time. Fill the rest of the bowl with smaller rough material ranging in size from 3/8 inch up to about 1 inch or a use ceramic media to get the bowl to operating capacity. 1) Load the bowl with approximately 4 pounds of material. The 4 pounds includes the weight of the rough and media used. 2) Add grit. 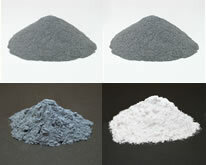 We use one level tablespoon of grit or polish for every two pounds of material. 3) Add water. A very important step. There is not a specific amount of water that you will add every time. The key is to add just enough water to get the grit to stick to the material. Here is how we do it... Turn the tumbler on before adding any water. Once it is running add a little water at a time. We use a taplespoon to ensure we don't hadd to much. If you add to much water it will pool at the bottom of the bowl rinsing the grit off the material. If you do not have enough water the grit cannot stick to the material. To help you maintain and get the best results possible with your tumbler, visit our Ultra-Vibe vibratory tumbler guide. We highly recommend: Modern Rock Tumbling by Steve Hart. Learning is the fastest way to improve the quality of rocks that you tumble. In this book you will learn from an expert with extensive experience. You will increase your abilities, learn to save time, money and have a great reference book that you will use again and again. How Long To Tumble Rocks? We highly recommend: Gemstones of the World (fifth edition) by Walter Schumann. One of the most popular gemstone books ever written, with over one million copies sold. It has about 100 pages of basic gemstone information and about 200 pages dedicated to photos and descriptions of over 100 gems and gem materials. We highly recommend: Gemstone Tumbling, Cutting, Drilling and Cabochon Making (by Jim Magnuson and Val Carver). This is our favorite book for a person who does rock tumbling and now wants to make beads, pendants and other jewelry from tumbled stones. Includes an introduction to cabochon cutting. Rock Tumbling Recipes is an occasional email message that we send a few times per year. It will help you improve your tumbling results, learn new methods, maintain your tumbler, and save time and money while tumbling. It is free, will not produce spam, you can unsubscribe at any time. View previous newsletter here. Have a question? Check our rock tumbling library. © 2009-2019 RockTumbler.com. All Rights Reserved. Images, text and code on this website are copyright by RockTumbler.com. All other use is prohibited.